The small town of Barmouth, population of around 2500 souls for most of the year, is one of those places that you grow to love once you get to know it well. A popular seaside resort for the summer weeks, swelling to some 10,000, for most of the rest of the year it is a peaceful harbour town set in one of the most spectacular estuaries in Britain. 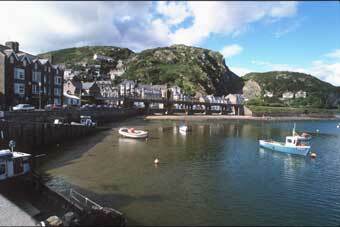 Barmouth itself gets a few mentions in documents of the 16th century. In the 1550's there was obviously some fishing activity as the 'herringe fisheries of Abermowe' form part of lease in 1549. The parish of Llanaber within which Barmouth falls had over 100 taxpayers listed in the Lay Subsidy Roll of 1292 and no doubt the ancient 'passage of the fferrie' granted by the Crown down the centuries and these fisheries suggests some form of habitation even back to this date. Many of the farmhouses near Barmouth date from the 16th century but built upon older sites. And yet this is a relatively recent settlement as the area is rich in early sites, most predating the Roman period by many centuries. You really are visiting an ancient landscape. Dinas Oleu - the Fort of Light - sited on top of the Rock indicates Barmouth's earliest origins. In 1587, Robert Edwards, of Llwyndu, is recorded as the merchant receiving a consignment of goods from the Barmouth registered Le Angel and in 1615 a barque unloaded, amongst other goods, thirty 'tonnes of Ffrench wines' Evidence of early cultured tastes! Barmouth grew to become an undistinguished but busy trading port, shipping out herrings in the 16th &17th centuries, mainly wool, slate (running from Porthmadog and elsewhere) and oak bark in the 18th & 19th centuries, the introduction of the railway in 1867 ensured that it was to be a new trade -holidaymakers - that saw the town's prosperity grow well into the 20th century. From the late 18th century Barmouth became a favourite stop for the travelling well-to-do and notable people of their time wrote of their experiences hereabouts - Charles Darwin, William Wordsworth, Shelley, Byron, John Ruskin to name a few plus a host of less well known travel writers - all seeking the magnificently picturesque scenery. 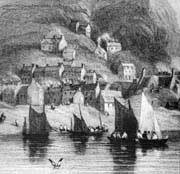 Many prints and engravings of Barmouth survive from this period. 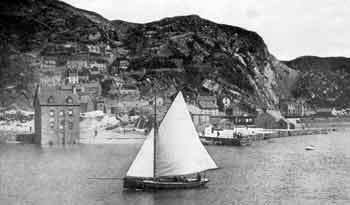 Unfortunately, this new found prosperity was to be at the expense of maritime trade and Barmouth today sees but a token fishing activity with a few pleasure craft making up the numbers and there is little evidence of this seafaring tradition:we can just admire the splendour of the harbour with its mountain backdrop. In some ways this makes it all the more alluring and you can lean on the quay railings and gaze across the estuary and just dream. Fortunately, the harbour has not had the 'marina makeover' yet so it very much retains its traditional feel.